Safety First – wife. mother. awesome girl. There’s a lot of information out on the internet on how to bike commute (or just ride) safely – things like Avoid the Door Zone, Be Visible and Predictable, and Get Used To Being Honked At. It’s all true and great information. But if I may, I’d like to share another piece of safety advice that is often overlooked: your emergency pack. Sure you probably toss a spare tube, some tire levers, and either CO2 or a hand pump in your saddle bag or rack pack … but I’m not talking about gear. Every ride, you need to have the following on you so that Go-d forbid something were to happen you can get help quickly. Cash. $20 will cover a number of situations. Emergency contact info, be it on paper or tagged as ICE in your smartphone. The code for your smartphone if you use password protect. Also, if you are riding solo – tell someone you know and trust where you are going and when you plan to return. Bike safe, friends! I’m on Week Two of bike commuting twice a week and it’s going amazing. I had one day where I failed to have an afternoon snack before I rode home from work and even though our time didn’t increase, I felt horribly sluggish and full of effort. Lady Rainicorn doesn’t have climbing gears so steep hills are a challenge – but worth it. I can feel my quads getting stronger. I’ve also noticed that technique counts – when I mash my pedals, I tire quickly but when I focus on round pedalstrokes, the hill doesn’t seem so hard. I’ve also been exploring multi-modal commuting – commuting using a combination of cycling and public transportation. On the days I am not able to bike all the way to work, I’ve been riding to the train station and locking up there. It’s actually quite nice to zip down the street in the morning and then be home at the end of the day in under 5 minutes. part of my bike commute. in the city. Yesterday I rode to work and back with my commuter friend. On the way home we detoured up through Forbidden Drive. 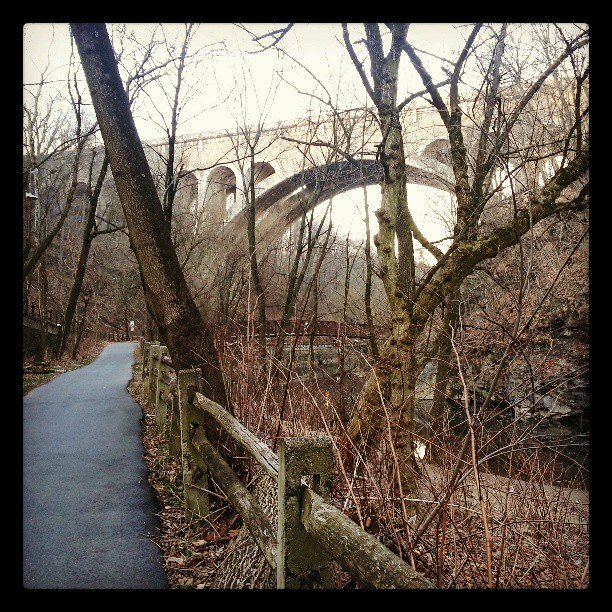 It was a lovely jaunt through the Wissahickon Valley Park at a lower speed, admiring the old stone bridges and beautiful surroundings. The 1.2 mile uphill slog from the creek back up to Mount Airy was better than I expected. It’s great because you come out of the creek basin and suddenly you are almost home. Refreshing and relaxing! Keep on truckin’ friends – see you on the road! Keep at bike commuting whenever you can. Do your buses have racks? I can travel around the LV with my bike on the front of a bus.